Tom D. initially contacted REALGOODS Company regarding his 5,600 sf cobblestone driveway project in the fall of 2016. Being experienced and a good planner, Tom wanted to line up the granite cobblestone for his project well in advance of needing the stone on site for a 2017 installation. He also wanted to get the best value for a large project, that was to deliver to Colorado. Delivering to Colorado makes the freight cost higher than most locations, that we deliver to. Here at REALGOODS Company we enjoy a good challenge such as meeting a limited budget in a location that is expensive to deliver to. We tell our customers that we deliver “everywhere”, but meeting the budget is sometimes much more difficult than the delivery. Tom shopped for several months looking for the best combination and value, and eventually returned to us, perhaps sensing that we could meet his price and quality objectives. We had quoted sever 4 and 5” thick cobblestones, and so our next offering to Tom was a Half Regulation Cobblestone. 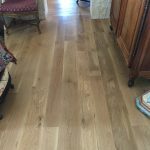 The product is 2-2.5’ thick which allows for twice the square footage on the truck when compared with full thickness Cobblestone and Belgian Block. This cuts the cost of freight in half making this project possible for the customer. 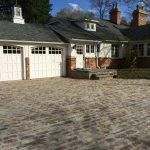 Tom requested samples of the Half Regulation Cobblestone and he decided that the stones were exactly what he wanted and they met his budget requirements as well. The Half Regulation Cobblestones are made by taking a 5x5x9 Regulation Cobbles and splitting it in half lengthwise. We proceeded to order the fabrication of the stones, and managed the deliveries in coordination with our customer. In an emergency situation toward the end of the install, we had to rush 12 half pallets by LTL delivery so that they could finish with some additional square footage that had not be planned for until the end of the project. Time, perserverance and the ability to solve problems for our customers is what we depend on, from ourselves, to make our customers happy.